Physical activity guidelines have changed over the years, and they may be a bit confusing. Typically, national guidelines recommend at least 30 minutes a day of moderate-intensity aerobic activity combined with 2 or more days of total-body strength training. Basically- We should be moving around more. An easy way to keep track of your physical activity is to wear a pedometer. Pedometers are relatively inexpensive ($5-$10), worn on your belt, and record the number of steps you take throughout the day. Make your goal at least 10,000 steps each day (2,500 steps is roughly one mile). Our office recently decided to have some fun and challenge ourselves in the physical activity department. 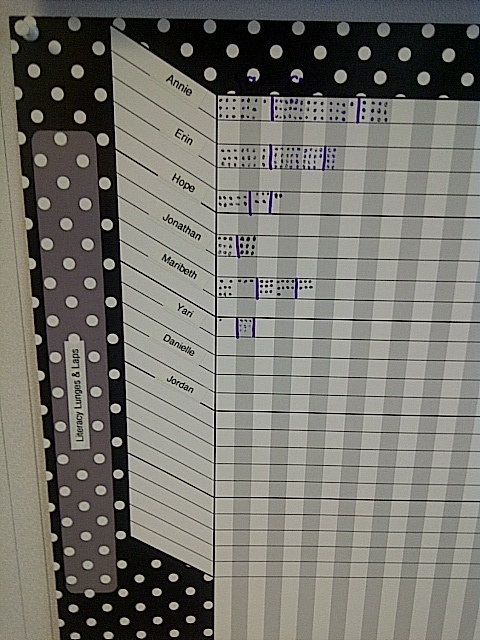 We started charting our physical activity in a “Literacy, Laps and Lunges” competition. Stars are rewarded for biking to work, taking the stairs (round-trip in our 11 story building), exercising for 30 minutes, daily pedometer totals (one star per 2,500 steps), or for participating in weekend activities, like helping a friend move. We have a small trophy that is passed from one winner (person with the most stars for the month) to the next, and everyone chips in to buy them a smoothie (plus lots of accolades)! The point is to get creative with it! To help keep you active and motivated, encourage others to join you. It’s a heart-healthy way to increase your energy, stamina, and positivity. So, get moving! This entry was posted in Health Literacy and tagged health literacy, office work outs, working out by Florida Literacy Coalition. Bookmark the permalink.